I guess there's not much one would envy me for these days, but these socks are! I got the Spring Fever socks from Julie - Woohoo! It does feel a bit stupid to write a post without being able to follow up other blogs let alone comment on them, but this one, of course, is mainly to make you all jealous praise my Bloomin' Feet pal Julie from stoneview and the Bloomin' Feet goddess and queen of the more intimate sock swaps, Amanda. Thank you both so much! But now, do you want to see details of the socks? Thank you so much, Julie! You did an amazing job knitting these beautiful socks. 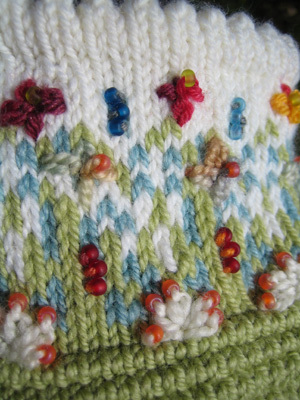 All the little embroidered flowers and beads! They are simply stunning. I already got compliments on them from many people who never bothered to comment on the socks I knitted myself. Some even remembered them and commented on them several days later (like when I was wearing my if I may say so pretty Embossed Leaves socks - "hey, you were really wearing some amazingly beautiul socks the other day"). Julie, you are not only lifting my spirits, you are also lifting my image as a sock knitter. No, of course I gave you the full credits! Julie did not stop by just knitting these beautiful socks, and sending them, of course. She also added some many extra goodies. I only managed to take a picture of the cute little hanks she added for if there should ever be the need for darning. Very much appreciated. I do hope, I can keep them a long while just looking cute, but I am afraid, these socks will experience a LOT of wear. They are just too adorable! 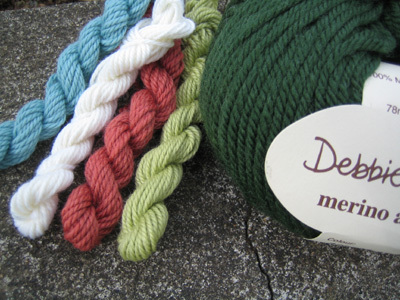 There was also some Debbie Bliss merino aran. Great feel, great colour, I love it! The obligatory sweet treat has partly vanished and I somehow forgot to take a picture. I also didn't take a picture of the other great, great gift she added: sock patterns. One of them is the Gothic Spire sock pattern by Cookie A and I am soo tempted to knit these socks up right away. I got also some other patterns by designers yet unkown to me and I am sure, they will appear on this blog sooner or later. Maybe even for Sockapalooza 4? Julie, I am amazed how generous and thoughtful your package was packed and what an amount of work, skills and love for knitting went into the socks you made me. Thank you so very much, I am still overwhelmed - and very happy! My sock headed towards their destination with a slight delay but should be arriving a-n-y m-i-n-u-t-e. At least I do hope so! I have to thank all the commenters (and again, I am very sorry for not replying to your helpful suggestions!) . I really felt encouraged to go with the leaf design. I do hope, my pal likes them, too. 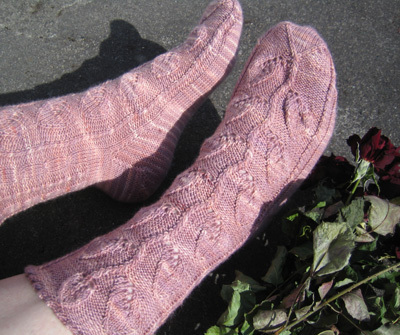 For the record, they were knitted in Socks That Rock, colourway Rose Quartz on bamboo dpns 2,5mm. I might consider to publish the pattern one day, but I can't bother at the moment, sorry. I am still or more again feeling really really bad in my back. If my doctor would know that I am sitting down in front of the computer at the moment, he wouldn't be pleased with me at all. No sitting for me! It is so boring and I am seriously becoming very impatient about the slow healing process. But better this then going to surgery I am told. Well, see you all soon for Sockapalooza 4! by Carola at 11:44 e.h. The socks look very happy in their new home! 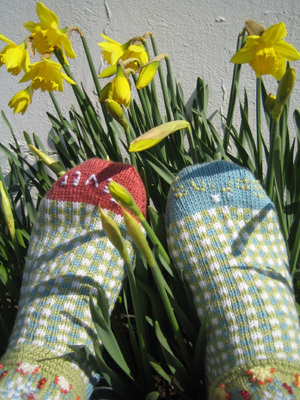 Daffodils are a favorite of mine so I'm sure the sock love them as well. The leafy socks are just gorgeous. I've been itching to knit something pink. maí 10, 2007 9:10 f.h. You sreally should publish that leaf sock pattern, it is beautiful. maí 10, 2007 9:50 f.h. Love those Spring Fever socks! Julie totally knocked those out of the ballpark - they are so fun and unique! And your BF socks look great. I'm sure the recipient will love them. Feel better soon! I wish there was a magical way to heal your back!!! maí 10, 2007 1:40 e.h.
No question about it--you got the BEST bloomin' pal! :-) I'm in awe of those socks. So many tiny, perfect details! Wow! Sorry to hear about your continued back problems. That's a shame. I hope they can figure out a better solution for you very soon! maí 10, 2007 2:15 e.h.
OMG, those are the most gorgeous socks. I'm seriously in awe of her sock knitting prowess. Yours are very beautiful as well. I'm sorry to hear you are still have having back problems, hope it heals quickly. maí 10, 2007 3:18 e.h.
maí 10, 2007 10:43 e.h.
What fun socks you got! And the pair that you sent off look lovely. Such gorgeous work! maí 11, 2007 12:17 f.h. Those blooming socks are gorgeous, you're one lucky gal! 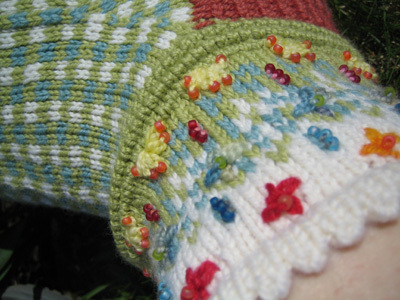 The leaf pattern socks are very beautiful, I really *heart* the color. maí 11, 2007 8:08 f.h. maí 11, 2007 9:34 f.h. maí 11, 2007 9:42 f.h. Hooray! Both Julie's socks and the ones you sent to Donna are beautiful! Great job. maí 11, 2007 3:53 e.h.
Lovely socks, both sets, I've gotta try more difficult socks! maí 12, 2007 6:40 e.h.
Wow, the spring fever socks are so very cool! But your pink socks are lovely as well. Good luck with your recovery! maí 18, 2007 10:51 f.h.